Successfully Added Z69 Max Android TV Box - Android 7.1.2, Bluetooth 4.1, WiFi, Google Play, Kodi TV, Octa-Core CPU, 3GB RAM, 4K Support, DLNA to your Shopping Cart. Throw amazing movie nights for friends and family with the Z69 Max Android TV Box. This compact Android Media Player can be easily hooked up to your regular TV set. Once in place, it lets you play games, stream movies, and even browse the web. Thanks to its 4K support, this Android TV box lets you enjoy movies, series, and sports games in stunning Ultra-HD resolution. With this 4K TV box at your side, you’ll be able to undergo a breathtaking media experience like never before. Whether you wish to enjoy a relaxing film evening with family, or play games and watch sports with your mates – this Android TV box is sure to keep you entertained. With 64GB ROM and an additional 64GB external memory support, this Android TV box packs all the memory needed to store your files. With access to the Play Store and Kodi TV, you’ll be able to download millions of the latest media files for free. The 4K TV box comes packed with an Octa-Core CPU and 3GB of RAM to meet all your entertainment demands. Whether it’s games, films, or TV Apps – nothing will slow this Android TV box down. Along with the latest Android 7.1 OS, you can be guaranteed to enjoy a smooth user experience over and over again. Thanks to its Bluetooth support, this Android TV box can be used efficiently with external devices such as you’re a mouse or keyboard. Additionally, the Z69 Max Android Media Player also supports Miracast and Airplay thanks to which you can easily mirror all that’s happening on your smartphone onto your big screen TV. DNLA furthermore supports easy file sharing between your different devices. With all these features at hand, you can be guaranteed to undergo an outstanding experience any time you turn on your Android TV box. 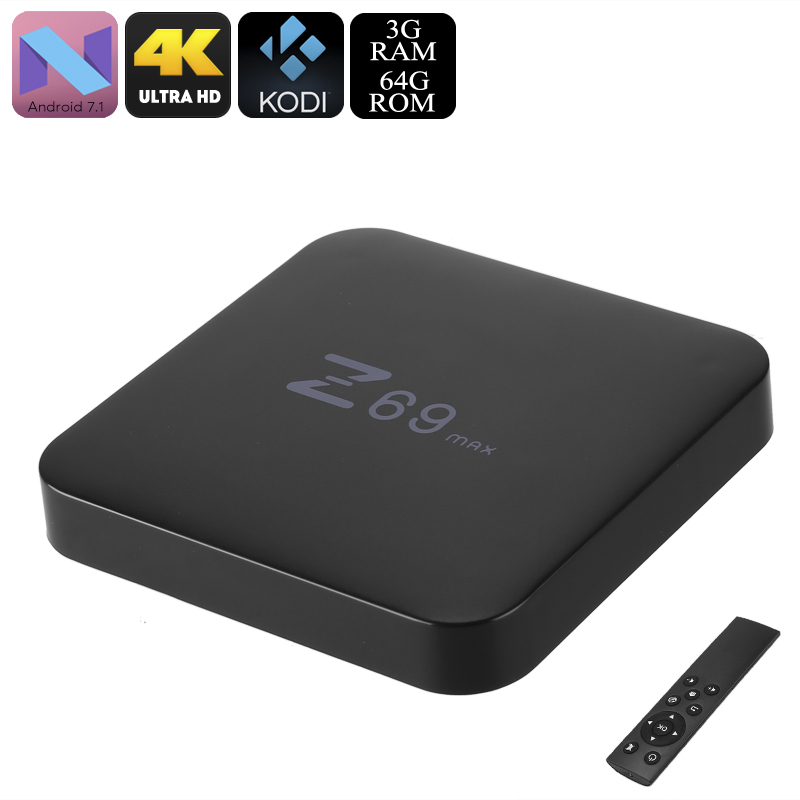 The Z69 Max Android TV Box comes with a 12 months warranty, brought to you by the leader in electronic devices as well as wholesale Android media players..